In line with our mission at J. Ottman Consulting, to help businesses meet consumer needs sustainably, our goal with WeHatetoWaste.com is to ignite a movement and galvanize a community of ardent ‘Waste Watchers’. You know them. They are the ones who get those last extra swipes from the Secret antiperspirant, line dry their jeans according to Levi’s Care Instructions for the Planet, and even shower with a ‘ShowerBuddy’ to save water and energy. These waste-hating consumers recognize the critical need to optimize resources so we can cut down on waste and pollution. They relish the opportunity to share with others their ingenious strategies for living lighter and getting the most from the products they buy. WeHatetoWaste.com springs from my own personal passion, eradicating waste. It manifested itself at age four when I started to drag home treasures from the neighbor’s trash — and took flack from siblings who called me ‘Junkie Jacquie’. WeHatetoWaste.com will highlight my own stories of leading a waste-less life, along with those of a passionate and growing community of ‘WasteWatchers’. The collective wisdom and output of this new forum will help us assist our clients in developing and marketing high value products that use the fewest resources while helping their consumers to save time, money, space — and live better. Don’t Waste Another Minute —Please visit WeHatetoWaste.com and take a look! I’d love your feedback. 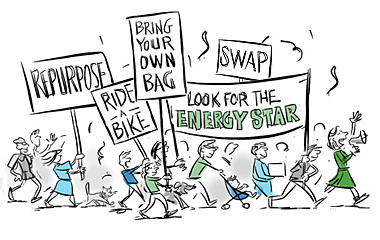 And if you’d like to collaborate on opportunities to work with sustainability leaders, governments and not-for-profits on profitable and productive strategies for reducing waste, please email me at info(@)greenmarketing(dot)com or call me at 212 879 4160 and let’s talk. 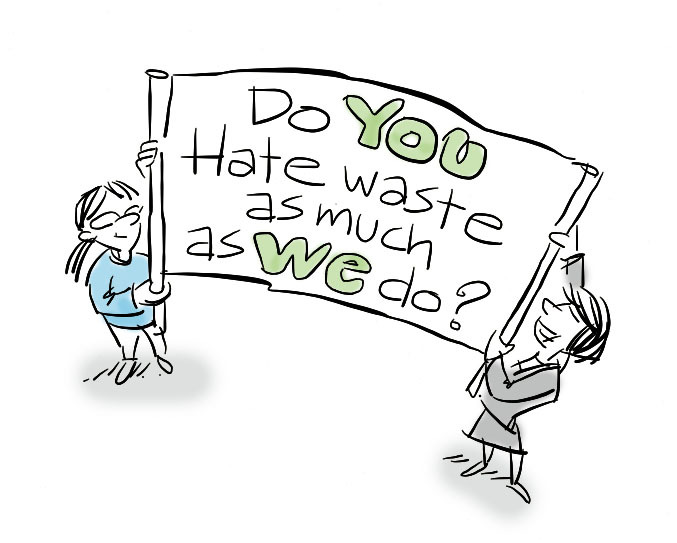 And if you hate waste as much as we do, we’d love to have you join us. Please subscribe. Comment (The discussion is already in full swing.) Like us onFacebook. Follow us on Twitter. Or pin us at Pinterest. And if you’re inclined, send us your own stories to share. Jacquelyn Ottman is principal and founder of the New York City-based J. Ottman Consulting, expert advisers on green marketing and eco-innovation to Fortune 500 sustainability leaders as well as several U.S. government eco-labeling programs. The author of four award-winning books on the subject, her latest is The New Rules of Green Marketing: Strategies, Tools, and Inspiration for Sustainable Branding (Berrett-Koehler, February 2011, named a top sustainability book of the year by Cambridge University. For more information and to download a free chapter, link here. 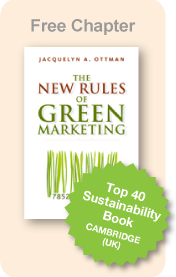 Subscribe to Jacquie Ottman’s Green Marketing Blog Link here. Copyright (c) 2013 by J. Ottman Consulting, Inc.
Graphics by Lorne Craig for exclusive use of J. Ottman Consulting, Inc.